Mark Meshulam is an expert witness and consultant for window & glass storm damage. Although the storm activity of the Windy City can’t even shine the shoes of weather experienced regularly along the coast of the Southern Atlantic and Gulf of Mexico (soon to be converted from an ocean into a Strategic Oil Reserve), we Chicagoans do experience our share of fluky, violent storms. A few weeks ago, a pair of storms blasted through our area, picking up anything loose on rooftops and propelling it into windows on adjacent buildings. Gusts were clocked at 77 mph, barely a Category 1 storm. As hurricane experts and anyone from Florida knows, when projectiles break through windows, it is the starting point for massive damage. When the maelstrom intrudes into the building’s interior, furnishings and finishes are damaged or destroyed, and sometimes the structure itself can be destabilized, risking collapse. And so, with the leadership of Dade County, Florida, following the disastrous hurricane Andrew, building codes have been developed in order to make buildings, and specifically the windows and glass doors resistant to penetration by wind-borne debris. A common element in the design of storm-resistant windows is the use of laminated glass. A piece of “lammy”, as we window hipsters call it, is comprised of two or more pieces of glass fused to a strong plastic interlayer under heat and pressure in an autoclave. Although there are ways to laminate glass using a liquid between the sheets of glass, the more commonly used method is to use polyvinyl butyral sheets (PVB) in thicknesses of either .030″, .060″ or .090″. Car windshields are typically laminated glass. The main benefit of laminated glass is that the interlayer holds the pieces of glass together even if the glass is broken. This can protect property and people. Here in Chicago, we have no codes related to hurricane resistance, and the use of laminated glass for windows is uncommon except where exceptional acoustical performance is required. Thus when the storm hits and the glass is broken, there is a real chance that the broken glass pieces can fall to the ground causing injury or death. 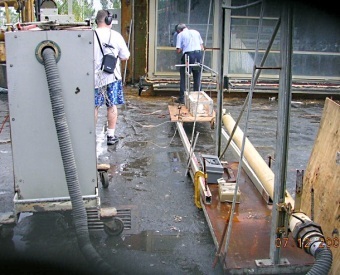 Windows being tested for huricane resistance at Construction Research Laboratory. Large missiles (2x4's) and small missiles (steel balls) are shot at the glass at close range. Although not the only such story, one of the most horrifying is the story of Ana Flores. She was struck and killed in 1999 by glass that fell from the CNA Tower as she walked hand-in-hand with her 3-year-old daughter. The $18 million settlement in the case is just a hint about the depth of the trauma experienced by the family and that child. The CNA breakage was not necessarily due to storm damage. It was, however, due to being allowed to remain in place after being broken. Lesson: If glass is cracked or broken, stabilize or remove it now. 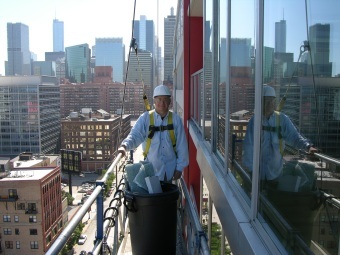 In Chicago, our approach to public safety from falling glass involves facade inspection. Buildings over 80 feet must regularly undergo inspections of all facade elements to reduce chances that loose materials could fall to the street. Prudent building owners and managers can go much further by making it a company culture to report, and act quickly, to stabilize and repair loose or dangerous facade elements, especially any cracked or broken glass. Prepared by Moshe Calamaro & Associates, Structural Engineers. Need to stabilize unsafe glass? At the center of the glass fracture pattern, two polygons can be found bordering one another. These polygons are typical of the breakage pattern caused by a nickel sulfide inclusion. The inclusion, a tiny dot, can be seen on the break between the two polygons. This pattern is also called a "butterfly pattern"